(SSC): Ella Kaye Lockwood was on deck to open the official Pirates Week Mike Lockwood Memorial Swim Meet last weekend with a prayer and a moving tribute to the vision, passion and community spirit which her late husband – Mike Lockwood – was known for.The meet took place November 13-16 at the Lions Aquatic Centre hosted by Stingray Swim Club and attended by swimmers from Stingray Swim Club (SSC), Team TI (TI), Camana Bay Aquatic Club (CBAC) and Special Olympics of the Cayman Islands (SOCI) and swimmers from Triple C School. 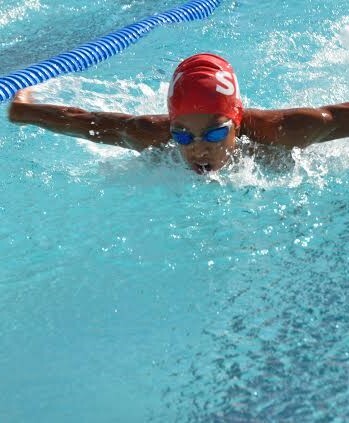 In the overall points standings, Stingray Swim Club placed 1st with 5,438.5 points; Camana Bay, 2nd with 4,586.5; Treasure Island 3rd with 1,429 and SOCI, 4th with 23 points. There were many notable swims over the four days, with new CIASA records set (still pending final official approval at this time, but they will be announced shortly). The relays took on a different appearance at this meet, as the swim clubs worked closely with CIASA to try something a little new … in the spirit of creating strong competition which would benefit all the swimmers, the coaches selected relay teams across the club … putting swimmers from all the clubs behind the same block. The resulting relays were exciting and saw some very competitive races taking place. High Points Winners Girls U6 – Libby Lindleyz (TI); Girls 7-8 Gabriella Royston SSC); Girls 9-10 Stephanie Royston (SSC); Girls 11-12 Alison Jackson (SSC); Girls 13-14 Stefanie Boothe (SSC) and Girls 15&Over Lauren Hew (CBAC). Boys U6 Phinn Ellison (CBAC); Boys 7-8 Jack Hendriksen (CBAC); Boys 9-10 Corey Westerbourg SSC); Boys 11-12 Jordan Crooks (SSC); Boys 13-14 Eddie Weber (CBAC) and Boys 15&Over Cole Morgan (SSC). Michael (Mike’s son) was on deck for the closing of the meet and along with Pirates Week Director Melanie McField, presented the awards.